What makes a single number so interesting that ancient Greeks, Renaissance artists, a 17th century astronomer and a 21st century novelist all would write about it? It’s a number that goes by many names. This “golden” number, 1.61803399, represented by the Greek letter Phi, is known as the Golden Ratio, Golden Number, Golden Proportion, Golden Mean, Golden Section, Divine Proportion and Divine Section. It was written about by Euclid in “Elements” around 300 B.C., by Luca Pacioli, a contemporary of Leonardo Da Vinci, in “De Divina Proportione” in 1509, by Johannes Kepler around 1600 and by Dan Brown in 2003 in his best selling novel, “The Da Vinci Code.” With the movie release of the “The Da Vinci Code”, the quest to know Phi was brought even more into the mainstream of pop culture. The allure of “The Da Vinci Code” was that it creatively integrated fiction with both fact and myth from art, history,theology and mathematics, leaving the reader never really knowing what was truth and what was not. This site studies this golden number Phi, and its mathematical cousin, the Fibonacci sequence, both of which have roles in the plot of this murder mystery, and distinguishes between the myth and the math. 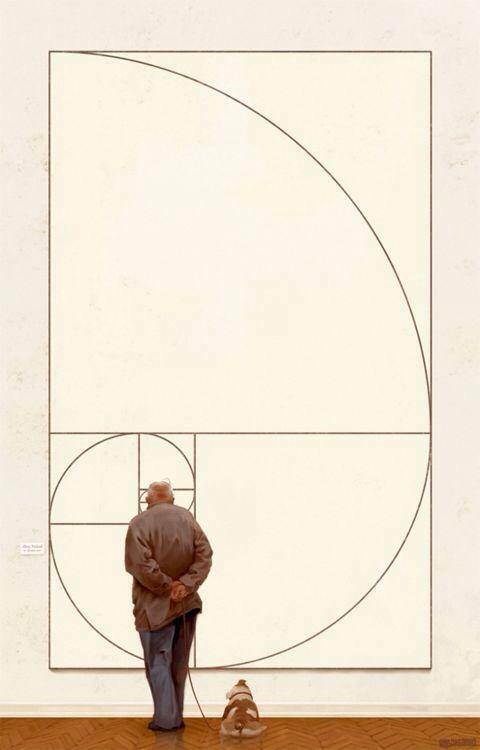 This Golden Ratio truly is unique in its mathematical properties and pervasive in its appearance throughout nature. The “mathematically challenged” may be more interested in the appearances of Phi in nature, its application to art, architecture and design, and its potential for insights into the spiritual realm, but let’s begin with the purest of facts about Phi, which are found in mathematics. Most everyone learned about the number Pi in school, but relatively few curriculums included Phi, perhaps for the very reason that grasping all its manifestations often takes one beyond the academic into the realm of the spiritual just by the simple fact that Phi unveils a unusually frequent constant of design that applies to so many aspects of life. Both Pi and Phi are irrational numbers with an infinite number of digits after the decimal point, as indicated by “…”, the ellipsis. Where Pi or p (3.14…) is the ratio of the circumference of a circle to its diameter, Phi or Φ (1.618 …) is the Golden Ratio that results when a line is divided in one very special and unique way. To illustrate, suppose you were asked to take a string and cut it. There’s any number of places that you could cut it, and each place would result in different ratios for the length of the small piece to the large piece, and of the large piece to the entire string. There is one unique point, however, at which the ratio of the large piece to the smaller piece is exactly the same as the ratio of the whole string to the larger piece, and at this point this Golden Ratio of both is 1.618 to 1, or Phi. What makes this so much more than an interesting exercise in mathematics is that this proportion appears throughout creation and extensively in the human face and body. It’s found in the proportions of many other animals, in plants, in the solar system and even in the price and timing movements of stock markets and foreign currency exchange. Its appeal thus ranges from mathematicians to doctors to naturalists to artists to investors to mystics. Where 1.618 is represented in upper case as Phi or Φ, its near twin or reciprocal, 0.618, is often represented in lower case as phi or φ. If you go further into the series and you’ll find that 233/144 = 1.61805, a very close approximation of Phi, which to ten decimal places is 1.6180339887. The Golden Ratio is also found in geometry, appearing in basic constructions of an equilateral triangle, square and pentagon placed inside a circle, as well as in more complex three-dimensional solids such as dodecahedrons, icosahedrons and “Bucky balls,” which were named for Buckminster Fuller and are the basis for the shapes of both Carbon 60 and soccer balls. There are many other fascinating mathematical relationships and oddities in both Phi and the Fibonacci series that can be explored in more depth, but for now let’s now take a step away from the purely mathematical and venture into nature, where Phi and the Fibonacci series manifest themselves pervasively, but not universally. Fibonacci numbers frequently appear in the numbers of petals in a flower. The positions and proportions of the key dimensions of many, if not most, animals are based on Phi. Examples include the body sections of ants and other insects, the wing dimensions and location of eye-like spots on moths, the spirals of sea shells and the position of the dorsal fins on porpoises. Even the spirals of human DNA embody phi proportions. More intriguing yet is the extensive appearance of Phi throughout the human form, in the face, body, fingers, teeth and even our DNA, and the impact that this has on our perceptions of human beauty. Some would argue that beauty is in the eye of the beholder, but there is sound basis in scientific study and evidence to support that what we perceive as beauty in women and men is based on how closely the proportions of facial and body dimensions come to Phi. It seems that Phi is hard-wired into our consciousness as a guide to beauty. For this reason, Phi is applied in both facial plastic surgery and cosmetic dentistry as a guide to achieving the most natural and beautiful results in facial features and appearance. With all the unique mathematical properties of Phi and its appearance throughout creation, it’s little wonder that mankind would not only take notice of this number and the Golden Ratio it creates, but also use it to capture the beauty and harmony of nature in our own creations in art, architecture and other areas of design. In some cases, mankind’s application of Phi is undeniable. In other cases, it is still the subject of debate. The Great Pyramid of Egypt appears to embody the Golden Ratio in the ratios of its base, height and hypotenuse, but its state of ruin and the absence of the mention of Phi in ancient Egyptian writings make it difficult to prove conclusively that this was by design. Since the Greeks knew of Phi at the time of the building of the Parthenon, it seems quite clear to many that the Golden Ratio relationships found therein were by design, yet the evidence is not complete and there are those who contest this as well. It is recognized that Leonardo Da Vinci used Phi, known in the 1500’s as “The Divine Proportion,” in a number of his paintings. Other artists, including Sandro Botticelli and Georges Seurat did as well. While this is undeniable, some see Phi relationships where others do not believe they were intended. The dimensions of the treasured Stradivarius violins built around 1700 show Phi relationships. It plays a role in music and acoustics. More modern applications of the Golden Ratio in architecture can be seen in Notre Dame in Paris, the United Nations Headquarters Secretariat building in New York and the CN Tower in Toronto. It’s commonly used in the design of products and logos and by many major corporations. It’s even being used in high fashion clothing design, such as in the “Phi Collection” announced in 2004 and covered by Vogue, Elle and Vanity Fair. Various studies have tested to see if a golden rectangle is the most pleasing rectangle to the human eye. Results of the studies are mixed, but generally point to rectangles with shapes close to the golden rectangle as being most generally pleasing. The Golden Ratio continues to open new doors in our understanding of life and the universe. It appeared in Roger Penrose’s discovery in the 1970′s of “Penrose Tiles,” which allowed surfaces to be tiled in five-fold symmetry, a task previously thought impossible. It appeared again in the 1980′s in the three-dimensional molecular arrangement of quasi-crystals, a newly discovered form of matter. As we enter the 21st century, Phi seems to be having a rebirth in integrating knowledge across a wide variety of fields of study, including time and quantum physics. The description of this golden proportion as the Divine proportion is perhaps fitting because it is seen by many as a door to a deeper understanding of beauty and spirituality in life, unveiling a hidden harmony or connectedness in so much of what we see. That’s an incredible role for a single number to play, but then again this one number has played an incredible role in human history and in the foundations of life itself. The line between its mathematical and mystical aspects is thus not easily drawn. Phi does not appear explicitly in the Bible or other ancient scriptures, yet we find that the dimensions given by God to Noah for the Ark and to Moses for the Ark of the Covenant both reflect a 5 to 3 proportion, Fibonacci numbers with a ratio of 1.666, and a reasonably close approximation to Phi. The Kaaba, the most sacred site of Islam in Mecca, is located very close to the golden ratio of the distance between the Earth’s north and south poles. Curiously enough, even the symbol for Phi, a circle with a line drawn through it, can be thought to represent a zero, or void, divided by one, or Unity, to create beauty, analogous to God creating the universe from nothing. In matters of reason, seeing is believing but in matters of faith, it is believing that first opens the door to seeing. Just as we need two eyes to add depth to our perception in vision, both faith and reason serve us in adding depth to our understanding of life and the universe in which we live. The best way to know for yourself where Phi is present and where it is imagined is to explore with an open mind, learn and reach your own conclusions. Enjoy the “phi”nomemon, whether to enhance your own understanding and appreciation of beauty and harmony in life or to apply it to your own artistic creations, like Leonardo Da Vinci and other masters before you. You may contribute your own insights and findings to share with our online community.